Place In Deep Purple Story: Story : well if you really need to ask, then you're probably on the wrong site! 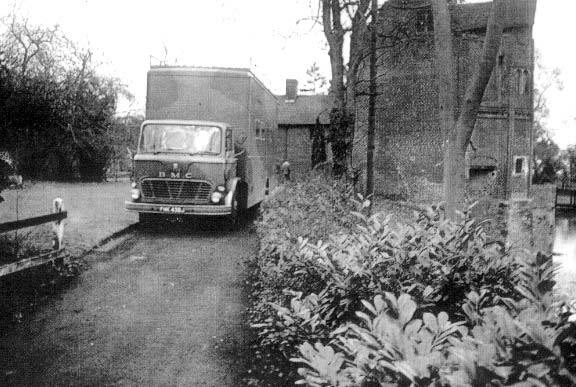 Deep Purple recorded their seminal album Machine Head in this famous mobile recording studio. It was parked alongside the Casino in Montreux when the fire destroyed the venue the band were to record in back in December 1971. Ian Gillan immortalised the studio in the song Smoke On The Water. They used it again, and later Rainbow and also Whitesnake used it. History: The studio was constructed for The Rolling Stones in 1968 so the band could record at Mick Jagger's country house. It was subsequently hired out when they weren't using it. Bands like Led Zeppelin, The Who and The Faces booked it as well as a host of lesser names. It was originally silver but painted in a camouflage pattern not long after it was fitted out, and remained like this for most of its working life, until it became a studio loaned out to young musicians to record demos in during the 80s and was repainted blue. After this is was again hired out commercially but demand had tailed off and it was retired in 1993. During it's life the internal equipment was changed and updated several times, and it is thought that the decks in place when Deep Purple used it are now in a studio in Scandinavia. It languished in a field for several years before it was auctioned off in 2001. 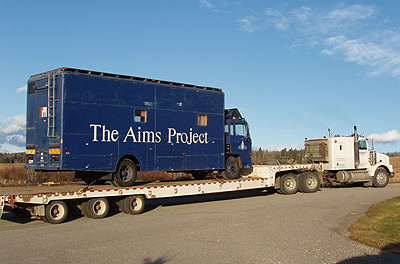 Update, June 7th: We've been in touch with the museum in Canada, and it now looks as if the actual studio back end is the original construction, but that this was removed from the original BMC chassis and cab in 1979 and put onto a DAF vehicle. Jesse Moffatt adds: "Our plans are to restore it to working condition and use it in conjunction with our live future performance space, restaurant, bar and to interpret its story as a museum exhibit. It is doubtful that it will return to the road. The truck was driven back to Calgary (from New Jersey), (but) broke down in Elkhart, Indiana where it was then trailered the remaining distance. The tow bill totalled $4,546US!" Location: The studio was purchased at auction by a Canadian keyboard museum in Calgary, who had it shipped over in 2001. Viewing: The museum is open to the public but I believe you need to make an appointment as they have a lot of rare early keyboards as well as more recent artifacts. Pictures courtesy Cantos Music Foundation, Canada, and EMI.